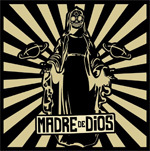 After bouncing around Italy and the general European theater in late 2014, Madre De Dios' debut album hits the shores of North America via the major digital download outlets. 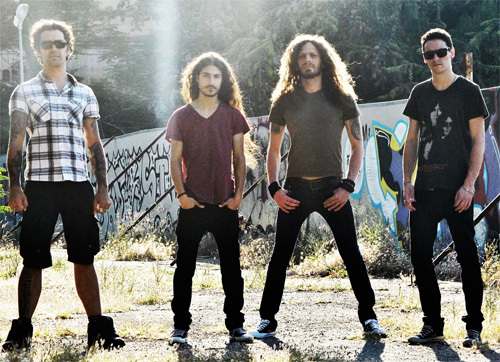 The band is an amalgamation of Italian musicians from various bands and genres. Curiously, the founder guitarist Stefano Pomponio, aka S.P. Jesus, comes from a death metal band. But this is not death metal. Thank you, Jesus. Pun intended. Basically, Madre De Dios plays good 'ol fashioned heavy rock n roll straight out of the Seventies but possibly washed through some Nineties grunge. Their sound is marked big d-tuned riffage, thumping rhythm section, and often brisk pace, and ample guitar solos. You might even catch a slight psychedelic and stoner vibe to the music. The vocals are clean, but essentially washed out. In other words, you can't understand a darn word the vocalist Frank Bizarre says. Oh yeah, that's his real name. Mother Bizarre said so. To the songs, from the start this is straight from gate charging heavy rock, keeping both the beat and groove crisp. And the best songs are those that roll from you speakers with a stronger melody and a catchy hook like Shake It Baby, The Evil Guide or Ordinary Man. Conversely, a song like Merry Go Round Song merely rumbles along a slouching heavy pace. Orbit, the bonus track, seems more a song of sharp guitars and distortion, which basically exorcise Bizarre from the equation. But if like big riffs and sweet leads, as this album is largely a guitar album, you find them in High Living in the Sunshine and Big Head. Madre De Dios tries a cover of The Beatles' Helter Skelter, calling it Mater Skelter. Though having a sharp tone, not unlike the U2 version, but not the same, it's rather blase and lackluster. But, for what it's worth, you can hear Bizarre's vocals. But that's only because you're likely to know the lyrics. Madre De Dios debut basically rocks out with a barrage of guitar-fisted heavy rock, as intended, but they certainly aren't giving us anything new. Check out their tunes at Reverb Nation and decide for yourself. Madre De Dios debut basically rocks out with a barrage of guitar-fisted heavy rock, as intended, but they certainly aren't giving us anything new.